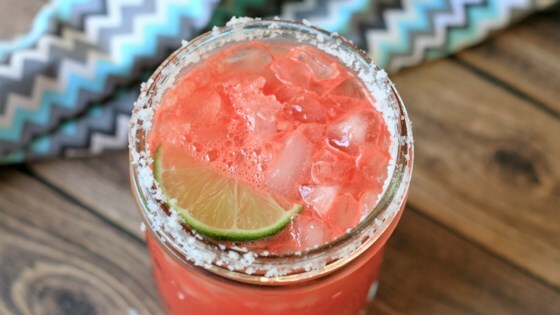 "This is the non-frozen version of my watermelon margaritas. These are so amazing and refreshing on hot summer days. To make a virgin version, omit the tequila and use a lemon-lime soda." Bring 1/2 cup sugar, water, and orange zest in a small saucepan to boil, stirring constantly. Simmer until sugar is dissolved, about 3 minutes. Remove simple syrup from heat and allow to cool completely. Place a small amount of salt or sugar into a saucer. Rub edge of margarita glasses with a lime wedge to moisten. Lightly dip the rim of the glass into the saucer to rim the glass; tap off excess salt or sugar. Fill rimmed glasses with crushed ice; pour margarita mixture into glasses and garnish with lime wedges to serve. Fill sugar or salt rimmed glasses with crushed ice, then pour margarita mixture over top. Garnish with a lime wedge. To make a frozen version, crush 1.5 cups of ice in a high-quality blender. Add watermelon, tequila, lime juice, and simple syrup and blend until smooth. These are BOMB. Make em all the time in the summer.